World Archeology: California couple may have to return $10 million treasure trove. 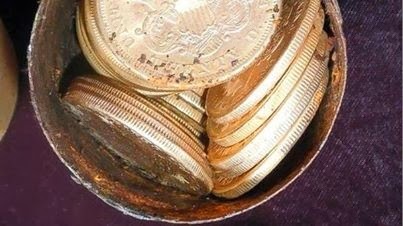 California couple may have to return $10 million treasure trove. 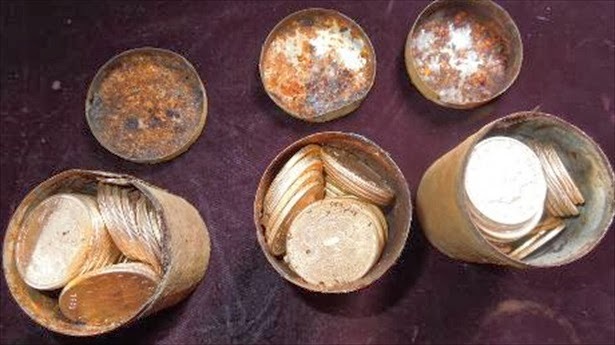 A US couple who unearthed gold coins worth more than $10 million might have to return them as they may have been stolen, a report said. 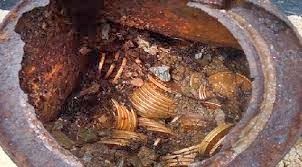 The California couple uncovered eight cans filled with more than 1,400 coins on their property, in what is believed to be the most valuable treasure trove ever discovered in the United States. They took them to a firm specializing in ancient coins, Kagin’s Inc, which valued them and announced last week that they will sell them, via online retail giant Amazon. But on Monday the San Francisco Chronicle linked the find — called the Saddle Ridge Treasure trove — to a robbery at the San Francisco Mint. It published a newspaper report from January 1, 1900, referring to the recent theft which it said mostly involved mint, uncirculated coins, with an overall face value of up to $27,000 — similar to the Saddle Ridge trove. Company boss Donald Kagin however told AFP he was “very confident” that the Saddle Ridge trove was not linked to the San Francisco Mint theft. “There’s a number of reasons why they can’t possibly be” connected, he said. He cited records from the time of the San Francisco theft suggesting it involved five canvas sacks filled with $20 gold coins — whereas the Saddle Ridge horde also had $10 and other coins. In addition the stolen coins “would have all been mint state, recently struck coins,” he said. “But only some of the coins in the Saddle Ridge horde are. Many others are circulated coins, struck over a long period of time and clearly buried over a long period of time. “The only parallel here is the similar (face) value. But again, not even that’s that close because of the different denominations,” he said. Kagin said plans to sell the Saddle Ridge hoard in about two months remain in place. Asked if he could guarantee to the couple, named only as John and Mary, that there would be no hitches in the sale, he said: “Nobody can guarantee anything. “But we are absolutely on our timeline with Amazon.com and kagins.com, to be selling these coins sometime in May,” he added.